Circa 1962. 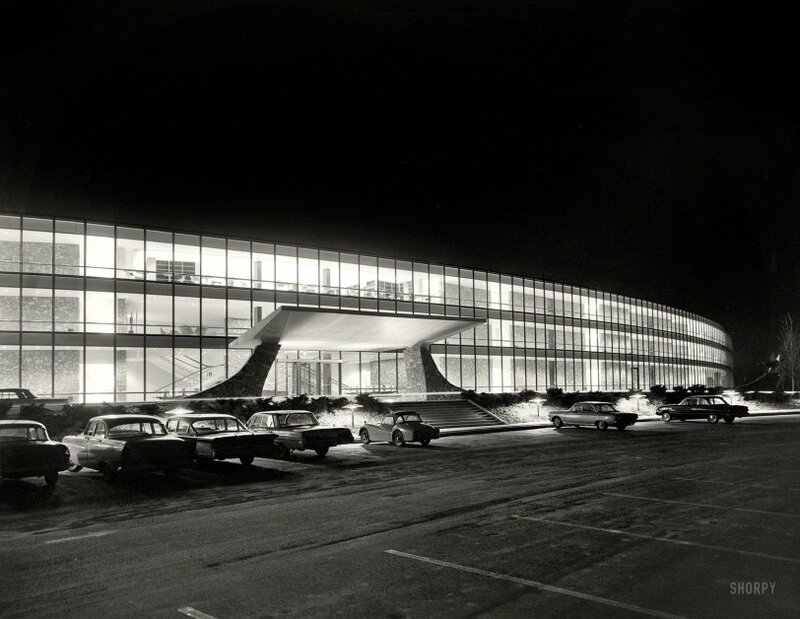 "International Business Machines Corp., Thomas J. Watson Research Center, Yorktown Heights, New York, 1956-61. Exterior. Eero Saarinen, architect." Large format negative by Balthazar Korab. View full size. Submitted by z396z28 on Fri, 06/28/2013 - 2:43pm. Submitted by ghostofwadelefler on Thu, 06/20/2013 - 12:48pm. If I'm not mistaken the car almost completely silhouetted at far left is a 1959-60 Studebaker Lark. Submitted by Don Struke on Thu, 06/20/2013 - 7:21am. Back in the 1960s when my brother Jerry was home on a weekend leave from the Navy, he managed to wreck his TR-3 in a big way; big damage-wise and big-upsetting-Mom-wise. She had dropped his insurance because he wasn't around. Except for that weekend. He rebuilt it as a race car and we both drove it. With its engine modifications it was quite fast, being clocked at 130 mph at Virginia International Raceway. At the Hershey Hill Climb I went off into the woods with it when the steering failed (probably a casualty of his accident) and I became but a hapless passenger, no longer in control of the car but deeply interested in its journey. Here it is. The small view is my brother's wreck. Submitted by SuomenPresidentti on Tue, 06/18/2013 - 11:44pm. Finnish native Eero Saarinen is really well known here in Finland. Nice to see beatiful examples his work here. BTW, my dad bought new white Lada 1200L in 1986. It also had a crank, which was useful when starter broke and a cool conversation piece. I used to sneak out at age 15-16 at night and take our lada for a ride. Legal age to drive being 18. Submitted by LaviathanRider on Tue, 06/18/2013 - 11:05pm. Drove one for a while in the early 70s. Sky blue four door automatic hard top, gear shift buttons were on the dash board to the left of the steering wheel. Four of us picked it up and moved it in a parking lot once. Drove her into the ground. On her last day I filled her up with naphtha and burned up the neighborhood streets before putting here out of her misery in the scrap yard. Submitted by Mvsman on Tue, 06/18/2013 - 8:21pm. of 20 years in the IBM dominated computer industry. I began in '82 as a "burster". I processed the printed output of reports and forms,and ran them through a machine that "decollated" the carbon paper.Thus,there were the required number of copies required by the department management. I also delivered them,by handtruck. Apparently I showed some aptitude,as I was promoted to the operator position on 2nd shift.This entailed answering console commands,mounting tapes,listening to angry users,and placing phone calls home to sleepy programmers who had to come in to fix an "abend",or abnormal ending to one of the programs they were responsible for. The hardware was IBM 370/158,4361,Magnuson,and much more.MVS,JCL,ROSCOE,TSO,you name it.Hundreds of employees used the text based terminals. I ran through various IBM mainframe jobs,winding up from 1997-2002 as system programmer and a support engineer for a prominent software company. By then,the internet was getting more robust,and our PTFs were available online. The old days were driven by manpower as well as automation.The old computer room,raised white floor,cold a/c and the double locked door! Submitted by Peter on Tue, 06/18/2013 - 7:19pm. While today most IT companies have no dress codes, other than maybe not allowing employees to be skyclad (I'll wait while you check Urbandictionary.com), back in the day IBM was quite the opposite. Almost all of their professional and managerial level employees were men, and they were required to wear white dress shirts, and only white. No stripes, no blue, no beige, just pure white. Submitted by switzarch on Tue, 06/18/2013 - 6:51pm. I had a 1970 MG Midget; cloth covered wires! Not a single wire in that poor dear had a modern vinyl coating, so when it was damp, you drove the Volvo. Submitted by Harvey in Fla on Tue, 06/18/2013 - 6:05pm. Same problems in wet weather as described by John Braungart in his Triumph. When I first got my 1962 Mark II, I noted there was a crank (yes, a crank in 1962!) mounted on the front wall of the boot (trunk) and I wondered why - but I needed it several times in wet weather. Submitted by ETres on Tue, 06/18/2013 - 5:40pm. Corvair engines are popular as inexpensive and reliable engines in experimental, home-built aircraft. A pilot at my home airport built a Zodiac with a Corvair engine, and it flies like a dream. Submitted by joenotes on Tue, 06/18/2013 - 4:45pm. As a 44 year IT person (it was called Data Processing back then), you can be pretty sure that those cars belong to developers and systems people; either troubleshooting a problem or burning the midnight oil on a software release deadline. BTW, no one has yet mentioned the '61 or '62 Ford Falcon to the very right in the picture. My first car was a '61 with a manual choke, 144 cu in motor, FordoMatic 2-speed transmission, and a tube-based pushbutton radio. It could barely get out of its own way, but I loved it! Submitted by SteveB on Tue, 06/18/2013 - 4:07pm. Jim Page commented about his 1965 Corvair handling well, and I'm sure that it did. Starting with 1965 model year, the Corvair had true independent rear suspension. The previous year, Chevrolet had added a camber compensator to the swing axle suspension, but the never recalled the older models for that modification (to the chagrin of Ralph Nader). The IRS models were what all of the early Corvair owners dreamed of. I had a 1962 Corvair Powerglide wagon with the same dashboard gear selector. It was a fun car to drive and handled well for the time (vs. an Impala or a Galaxie), but would "crab" the rear axle when a radical maneuver was attempted. The swing axle would fold under the car, and if you weren't lucky, the whole car would roll over. My wagon had been a beach car and no matter how much a vacuumed and swept the interior, I always found more sand the next day. Still, it was a good car that served me well. Submitted by JohnBraungart on Tue, 06/18/2013 - 1:24pm. weren't the greatest because they had electrical systems by Lucas, Prince of Darkness. I guy I knew had a Spitfire that in rain or snow, wouldn't start without a push down the street from my Volkswagen. How a country with a climate like Britain could have given rise to that company is beyond me! Submitted by Larc on Tue, 06/18/2013 - 1:21pm. Located at 1101 Kitchawan Road. This overhead shot shows most employees would have parked in the big lot at the rear of the building. Submitted by Jim Page on Tue, 06/18/2013 - 12:24pm. I had a 1965 Corvair 500, which was the four-door base model. I dearly loved that car, and drove it through high school and into college. It had the automatic-transmission lever on the dash, which I couldn't figure out when my dad presented me with it; he walked out to ask why I wasn't driving my new car, and I hated to admit I couldn't put it in gear! Those Corvairs had a characteristic burned-oil smell that I loved, and having the spare tire in the engine compartment only added to the strangeness. My Corvair's transmission finally gave out, probably from my evil habit of flipping it into reverse when going down the road so it sounded like I was popping a wheelie!!! My high-school friends and I still talk about that wonderful car, and I think they were surefooted, no matter what some folks said about them. Submitted by swaool on Tue, 06/18/2013 - 11:12am. Looks like a Triumph TR3A parked near the entrance. Had one of those in high school - could never get the carbs synched right. Submitted by Solo on Tue, 06/18/2013 - 11:06am. Though it might be late on a dark winter's afternoon, I suspect that this shot was taken after "normal" working hours. Nevertheless, the number of cars in the parking lot (the poor TR-3 looking quite at odds with its Detroit iron fellows) suggests that there's actual work being done inside, at least by those senior enough to rate a prime parking spot. Though far from a start-up by 1962, IBM still had some exciting years of innovation ahead of it. Submitted by Born40YearsTooLate on Tue, 06/18/2013 - 9:26am. The newest car I can identify is a 1962 Chevy Impala, the fourth car from the left. Submitted by David in Leicest... on Tue, 06/18/2013 - 8:49am. This is a splendid photograph, for several reasons; the architecture, the mood ... and the cars. I knew that, one day, I would find a Corvair on one of your photographs. Maybe there has been one earlier, but I haven't seen it. This 4-door was likely almost new when the picture was taken. I am restoring a 1965 Corvair Monza 140 HP Convertible. Corvairs are rare as hens teeth here in Britain. I had a number of Corvairs as a kid, many years ago. Over the years, I lost interest in cars in general; but the Corvair always occupied a special place in my memories. When I retired, I thought, "why not"? Given our weather here, I might even get around five days a year when the top can come down. IBM and a Corvair .... I like the association. Submitted by switzarch on Tue, 06/18/2013 - 8:45am. Those canopy supports give a suggestion of his work for TWA. Interesting contrast with the balance of the building. Submitted by Mark W Rummel on Tue, 06/18/2013 - 8:41am. This is exactly, precisely, 100% similar to all the images on Mad Men on TV every week. Just seeing images from that late 50s - early 60s era instantly recalls it. Submitted by Eric on Tue, 06/18/2013 - 8:25am. The small sports car in front of the entrance is most probably a Triumph TR3A. 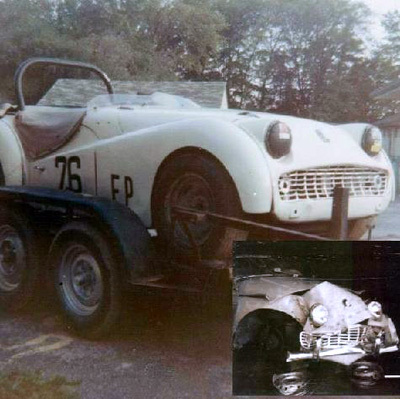 If it was very new at the time this picture was taken, it might be a rare TR3B, which had the slightly larger engine and fully synchronised gearbox of the TR4. TR3A's were and are great cars. I should know, because I drove mine to work and back today. Submitted by Jon on Tue, 06/18/2013 - 7:33am. Interesting to see the Triumph TR3 sitting out front. Definitely stands out against the other American iron in the lot. Submitted by Mr Mel on Tue, 06/18/2013 - 7:29am. I'll guess that most of those cars belong to the cleaning crew. Submitted by TheSenator on Tue, 06/18/2013 - 5:36am. TheSenator grew up near this amazing Saarinen specimen! 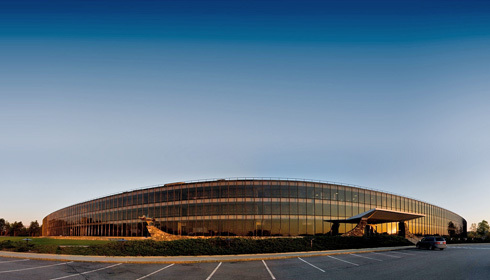 I loved driving through the wooded IBM campus to see this stark black marvel on the hill, the long low curve of the exterior appeared endless. Still fab today. Submitted by DeeGee on Tue, 06/18/2013 - 5:16am. This is the home of Watson, the computer system that won Jeopardy against two former champions a couple of years ago. 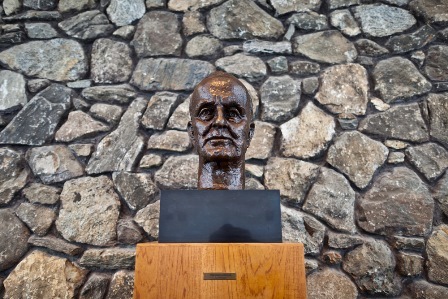 As part of that event, Wired magazine did a wonderful series of interior photos of the Research Center, including a picture of the bust of the original Watson below.